Quezon City – The abundance of fruits almost everywhere in the Philippines is an added perk of visiting the country, apart from the weather and the beaches, of course! Mangoes, pineapples, bananas, and coconuts are widely sold in the streets every day. The island of Mindanao has long been home to different varieties of fruits, including the famous durian, notorious for its overpowering smell. Recently, however, another fruit cultivated in the southern Philippines is becoming a new favorite for both locals and tourists. Marang, as it is known in Mindanao, is comparable to breadfruit (kamansi), jackfruit (langka), and durian, except for its sweet scent. Its scientific name is Artocarpus odoratissimus, and it originated in Borneo but is widely grown in the Philippines, especially in Davao, North Cotabato and Agusan. Marang has a round to oblong shape and is slightly smaller and lighter than jackfruit. Inside its thick rind is a mass of white, juicy, and edible seeds embedded in pulp. Other regional names of marang are tarap, madang, johey oak, and terap. Raw and freshly opened marang should be eaten immediately as it quickly oxidizes and loses its flavor. Aside from its delightful taste, marang is also good for one’s body. Studies show that it is loaded with nutritional value, containing calcium, protein, vitamins A and C, beta-carotene, crude fiber, retinol, and iron, among others. Moreover, the fruit is packed with carbohydrates, making it a good alternative fuel source for athletes who need to replenish energy levels and fight fatigue. In addition, it is an effective natural treatment for those suffering from constipation, as it triggers regular bowel movement. Marang are harvested from large trees that grow up to 25 feet long and yield fruits in 3 to 6 months. Mature fruits ready for harvest transform from green to yellow, each weighing around 1 kilogram. The marble-sized seeds can be prepared by roasting or boiling with hot water.The cooked seeds taste just like peanuts or maybe even crunchier. The fruit is a perfect ingredient in formulating processed desserts, such as ice cream and bottled jam or puree. One disadvantage of marang is its low shelf life. Because it easily deteriorates, shipping to other parts of the country is not recommended, as it requires marang to be stored for long periods. 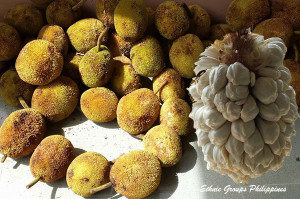 Although the usual season for this fruit is between the months of September to December, it can be found all year round in other places within Mindanao where it is abundantly cultivated. Studies are currently being conducted to discover an approach for its sustainability with the hope to one day export marang to more far-off places. It has been introduced to Australia and Brazil and reported to have been cultivated as well in a handful of farms in Hawaii. A number of locals and tourists have reviewed this exotic food, and they were mostly positive in spite of its strong smell. Foreigners in the country, especially those living in the island of Mindanao, swear by its pleasant taste. Moreover, culinary artists have testified to its incredible flavor. The Philippines offers a wide variety of fruits for export, and marang is a great addition to the list. It is hoped that more exotic fruits will be discovered. Image from Pau Dugso Jr.